When I select "Nachricht als neu bearbeiten" ("Edit mail as if new ? "), I receive a warning message (attached) that doesn't seem to relate to what I just did. Also it has a lot of smaller writing errors (marked). The last half sentence must not stand alone. Regardless, the mail window opens. On pushing "Send" the mail won't be sent, window stays open, a circle of dots notifies waiting time. This somewhat locks the whole cryptography. I can't reliably save this as a draft and using such a draft will repeat the problem. 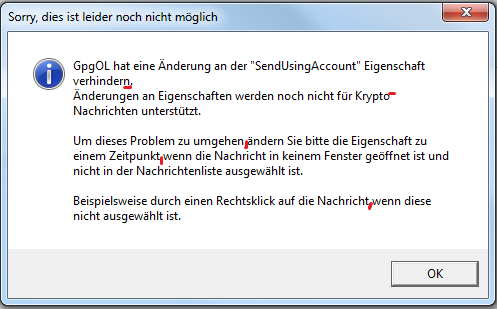 If the warning message is correct (by a little modification) and opening of the unsendable mail window can't be stopped, the warning should be stronger! Any text written in the mail may be lost after restarting. rO88a3204d34b9: Change S/MIME behavior depending on Exchange ver. I can reproduce the problem. This was apparently not tested. I had to search myself a bit to find the option to resend a mail. Should be fairly easy to fix both the warning and sending such a mail. Our internal state model does not handle this situation and only thinks "This is a decrypted mail, I have to prevent Outlook from persisting the decrypted content." Oops. I confused the ticket numbers rO34f6bb73882e: Implement send again for crypto mails. Would be the correct commit for this ticket. In my tests it does work nicely now. We detect the "Send Again" state and correctly handle it. Sign / Encrypt is preselected depending on the state of the original mail. Even works with attachments. A new release with this fix will come soon.